10:43pm: Martin will earn $1.95MM, Jim Callis of MLB.com tweets. It would appear, then, that Oakland has just under $300K to play with for selections made after the tenth round. Bonuses for players selected outside of the slotted rounds count against a team’s total allocation only to the extent that they exceed $100K. 5:33pm: The Athletics have announced the signing of first-round draft pick Richie Martin. The University of Florida shortstop was taken with the 20th overall selection. Bonus terms have not yet been reported, and unsurprisingly were not announced by the club. Oakland’s first pick came with a $2,214,000 pool allocation (via Baseball America). Most prospect writers placed Martin in the 30 to 40 range among draft-eligible prospects. Baseball America ranked him highest (31st), citing Martin’s strong overall athleticism and defensive ability. At the plate, BA says that the infielder is a line-drive hitter who could have some future power potential. ESPN.com’s Keith Law was somewhat less impressed, rating Martin 75th on his board. While he praised Martin’s improvement as a hitter, Law says that the former Gator “projects as an average hitter with below-average power” and could add value on the bases. Martin becomes the last of the A’s picks from the first ten rounds to reach agreement (via MLB.com’s bonus tracker). As things stand, the club has undertaken $827,800 in above-slot obligations to sign high school righty Dakota Chalmers and UNC outfielder Skye Bolt, and has saved $632,900 on its remaining picks. The team can go up to 5% over its total pool allocation without losing draft picks (instead only paying a tax on the overage), freeing an additional $272,205. Put it all together, and the A’s were capable of spending up to $77,305 over slot on Martin (in total, $2,291,305). If the bonus comes in below that number, the difference could be applied toward later-round selections. 10:23pm: Boston has announced the signings of both Benintendi and third-rounder Austin Rei. The catcher will receive an at-slot, $724,400 bonus, Callis tweets. Rei is a defensive specialist; indeed, Callis calls his work behind the plate the best of all this year’s draft-eligible collegians. The questions come with the bat, though there are signs that Rei can contribute on offense. As MLB.com wrote in ranking him 87th on its board, Rei rates solidly in terms of bat speed and approach. 10:30am: The Red Sox have agreed to terms with No. 7 overall draft pick Andrew Benintendi, reports MLB.com’s Jim Callis (via Twitter). 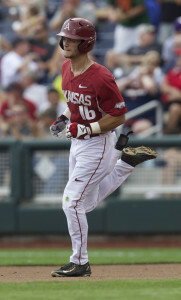 The lefty-swinging outfielder out of the University of Arkansas will receive the full slot bonus of $3,590,400, per Callis, who feels that Benintendi possessed the best all-around tools of any college hitter in this year’s draft class. Callis and colleague Jonathan Mayo ranked Benintendi eighth among draft prospects, while Benintendi ranked ninth per Baseball America and per Kiley McDaniel of Fangraphs. ESPN’s Keith Law ranked Benintendi a bit lower at No. 21, though he noted that, “No one has improved his stock this spring more than the sophomore draft-eligible Benintendi…” which is lofty but likely deserved praise after Benintendi led the SEC in OBP, homers and slugging percentage. Callis and Mayo praised Benintendi’s smooth swing and ability to consistently barrel up the ball. That’s complemented by plus speed, the MLB.com duo notes, giving Benintendi a chance to be a base-stealing threat and to stick in center field. BA notes that Benintendi didn’t play summer ball last year and wasn’t even on some clubs’ radars entering the season, but he quickly caused a “who’s-who of scouting directors and front-office officials” to fly in to watch his performance as the season progressed. McDaniel pegs the potential of each of Benintendi’s five tools as solid-average or better, and BA notes that the only real knocks on the 5’10” outfielder are his size and lack of a lengthier track record. The Rays designated reliever Ronald Belisario for assignment after tonight’s game, the club told reporters including Marc Topkin of the Tampa Bay Times (via Twitter). Tampa Bay recently decided to add the 32-year-old to its big league roster when he exercised an opt-out clause in his minor league deal. Since that time, Belisario has thrown eight innings for the club — including his appearance tonight — and allowed seven earned runs. He has compiled six strikeouts against four walks on the year. Belisario was throwing rather well in Triple-A, sporting a 3.26 ERA with 5.3 K/9 against 2.7 BB/9 over 30 1/3 frames. And he’s had success in the big leagues in the past. But clubs considering Belisario will surely note that his fastball velocity (in his few big league outings this year) was down about two miles per hour from recent seasons. Pirates lefty Clayton Richard has a clause in his deal that provides a 72-hour window during which Pittsburgh must make him available to other clubs, Nathan Baird of JConline.com reports. That “upward mobility” provision went into effect today. Here’s how it works, per the report: If another team is willing to put the veteran hurler on its big league roster, then the Pirates must either deal him to that club or, instead, add him to their own 25-man roster. In the event that no suitor emerges, however, then the Bucs can keep Richard at Triple-A. Once a 200-inning starter for the Padres, the 31-year-old fell apart in 2013, struggling to a 7.01 ERA and ultimately undergoing shoulder surgery. He has not returned to the big leagues since, but is thriving this year at Triple-A Indianapolis. Over 62 frames in ten starts, Richard owns a 1.89 ERA with 4.4 K/9 against 2.0 BB/9. He also tells Baird that he’s more than willing to work from the pen to get back to the majors. Richard previously declined an opportunity to opt out of his deal at the start of the season, though this time around the decision seems to be out of his hands entirely. Highly regarded outfielder Yadiel Hernandez has left Cuba’s national team — which was playing in North Carolina — in hopes of achieving MLB free agency, Ben Badler of Baseball America reports. Hernandez placed 16th on BA’s most recent list of top Cuban prospects. That being said, Hernandez is not a prospect in the sense we use the term for players already playing within the MLB hierarchy. He is already 27 years old and an established player in Cuba’s Serie Nacional, so it would seem that he profiles more as a near-term contributor. Because of his age and experience, Hernandez will not be subject to international spending limitations (as with countryman Hector Olivera, most recently). Badler explains that Hernandez is a small and not overly toolsy player who profiles as a corner outfielder. That seems to be a rather unexciting profile, at least at first glance. But the left-handed hitter has excellent on-base ability. Indeed, he slashed .369/.509/.535 over 369 plate appearances in his most recent campaign in Cuba, walking 77 times — good for a 20.9% walk rate (which is higher than all currently qualifying MLB hitters, for some frame of reference). In its full scouting report (subscription required, and recommended), Baseball America likened his overall skill set to that of Red Sox outfielder Daniel Nava. TODAY: The Astros have officially announced Cameron’s signing. YESTERDAY, 2:20pm: Cameron’s bonus will indeed come in right at $4MM, reports Jim Callis of MLB.com (via Twitter). 2:04pm: The Astros and No. 37 overall selection Daz Cameron have an agreement in place, and Cameron is in Houston to sign his contract, reports Mark Berman of FOX Houston. Evan Drellich of the Houston Chronicle tweets that an introductory press conference will be held tomorrow at Minute Maid Park. Cameron, a Scott Boras client and the son of former Major Leaguer Mike Cameron, has been widely expected to require a significantly over-slot bonus in order to forgo his commitment to Florida State. Cameron, a high school outfielder from Georgia, was rated by most as a Top 15 talent in this year’s draft, but signability issues caused him to slip to the Astros with the 37th selection. Baseball America ranked Cameron as the fifth-best prospect in this year’s draft, while Jonathan Mayo and Jim Callis of MLB.com ranked him sixth on their Top 200. Both ESPN’s Keith Law and Fangraphs’ Kiley McDaniel rated Cameron as the No. 12 prospect in this year’s draft, and many mock drafts leading up to the actual event had him going in the top five or six picks. BA’s scouting report notes that Cameron is a divisive player, as some scouts are put off by the fact that he doesn’t always perform against premium pitching. However, BA notes that he has elite bat speed and hand-eye coordination, which position him well to make necessary adjustments down the line. BA notes that he could have average-or-better tools across the board and can stick in center field as a regular at the position. Both Law and McDaniel agree that Cameron could one day be a big league center fielder, although his tools didn’t develop into the potential No. 1 overall type of talent that some had expected earlier in his high school career. As I noted when the Astros signed No. 2 pick Alex Bregman, the team has saved $2.3MM on other picks, which it can put toward offering Cameron a well above-slot bonus. The No. 37 pick’s slot bonus is $1.669MM, so the Astros could reasonably offer roughly $4MM to Cameron in order to sign him. Pete Mackanin will manage the Phillies for the remainder of the 2015 season, GM Ruben Amaro Jr. announced today. Mackanin, formerly Ryne Sandberg’s third base coach, has been managing the team since Sandberg’s sudden resignation last week. The Phillies also announced that Jorge Velandia, the team’s assistant minor league field coordinator, will join the Major League staff as an assistant coach. The 63-year-old Mackanin had a nine-year career as a Major Leaguer and is now, strangely, in the midst of his third stint as a team’s interim manager following a midseason firing/resignation. Mackanin was the Pirates’ interim manager for the final month of the 2005 season after Lloyd McClendon was fired, and he served as a temporary skipper for the Reds in 2007 after Jerry Narron was dismissed. Mackanin has also served as a manager in the minor leagues, and he’s occupied various Major League coaching roles over parts of 13 Major League seasons (including a stint as the team’s bench coach). Earlier today, ESPN’s Jerry Crasnick tweeted that he got the sense the Phillies simply needed to make sure that Mackanin was comfortable managing the club for the rest of the year. The Phillies yesterday announced the hiring of Andy MacPhail as the successor to president Pat Gillick, adding that MacPhail’s title of president would become official following the season when Gillick retires. It stands to reason that MacPhail will oversee the hiring of a permanent manager, although it’s certainly possible that Mackanin would be in the mix for that position if he desires. He’s been with the Phillies organization since 2009. Whitley ranked as the seventh-best prospect in this year’s draft class in the eyes of Baseball America. ESPN’s Keith Law, meanwhile, ranked him 11th. Kiley McDaniel of Fangraphs rated Whitley as the draft’s No. 15 prospect, and he placed 17th on the Top 20 of MLB.com’s Jonathan Mayo and Jim Callis. Whitley’s draft stock took a step forward after he made adjustments based on input from pro scouts at last year’s Area Code Games, per BA’s report. As of right now, the only one of his tools that doesn’t project to be above average is his arm, but he takes “gazelle-like strides” in center thanks to plus speed and projects to hit for power. McDaniel calls Whitley a “linebacker-looking athlete” that can play center and has power, though he notes some questions about consistent contact. Law feels he has more upside than fellow first-rounders Kyle Tucker and Trenton Clark but less certainty due to concerns around his hit tool, and MLB.com feels that he has average-or-better tools across the board with an advanced approach at the plate. Whitley had been committed to Wake Forest. Though Clay Buchholz figures to draw plenty of interest on this year’s trade market, Scott Lauber of the Boston Herald opines that the Red Sox should be steadfast in their refusal to trade him. Lauber notes that Buchholz, earning $12MM in 2015, is slated to earn $13MM and $13.5MM via club options over the next two seasons — bargain rates for a pitcher with his talent, even if it comes with inconsistency and injury risk. Meanwhile, Brian MacPherson of the Providence Journal takes a different approach, opining that the Red Sox owe it to themselves to at least entertain offers for Buchholz. MacPherson looks back to last year’s return for 1.5 years of Jeff Samardzija and notes that 2.5 years of Buchholz could bring a similarly strong return. Though the team will need pitching in 2015, MacPherson writes that Buchholz’s value is unlikely to ever be higher, and a team willing to pay for the type of pitching he’s been doing over his past 10 starts (2.33 ERA) may very well make too good of an offer to refuse. MacPherson wonders if old friends Theo Epstein and Jed Hoyer, now with the Cubs, would be interested in parting with some premium young talent to acquire Buchholz. Prior to the Red Sox’ signing of Pablo Sandoval last year, the team inquired with the Athletics about Josh Donaldson but were told he was not available, reports Jason Mastrodonato of the Boston Herald. That would seem to line up, to some extent, with comments from A’s officials early last winter indicating that little consideration would be given to moving Donaldson. (“That would be stupid,” one official told the San Francisco Chronicle’s Susan Slusser last October.) Donaldson, of course, wound up with the division-rival Blue Jays and is enjoying a monster season. With Ivan Nova now healthy and back in the Yankees’ rotation, Adam Warren will shift into the team’s bullpen, the right-hander tells Mark Feinsand of the New York Daily News. As Feinsand notes, Warren was the likeliest candidate to do so, given his recent success in the bullpen and the fact that he’s already exceeded last year’s innings total while working as a starter. Bud Norris has struggled a good deal for the Orioles this season, but there’s no current talk of removing him from Baltimore’s rotation, writes Dan Connolly of the Baltimore Sun. Some have speculated that Norris is pressing in light of his upcoming free agency, and as Connolly writes, Norris indirectly touched on that topic following another rough start Monday. “I don’t know where my future’s gonna take me,” he said. “All know is I can handle what’s in front of me right now and trying to work through this is the No. 1 priority and getting back out there and helping my team win games.” Norris said he’s not worried about the possibility of losing a starting spot to Kevin Gausman, Mike Wright or Tyler Wilson, but Connolly wonders how long the club will stick with the struggling veteran.